WASHINGTON — President Obama said Friday that Veterans Affairs Secretary Eric Shinseki will resign in the wake of systemic problems with the health care for veterans. Obama said he regretted accepting the resignation, but "the VA needs new leadership" and he agreed with Shinseki that he has become a distraction. "We don't have time for distractions," Obama said. "We need to fix the problem." Obama spoke after what he called a "serious conversation" with Shinseki amid calls for Shinseki's resignation in the wake of problems at VA hospitals across the country. Obama and Shinseki sat down in the Oval Office hours after the VA secretary apologized to all veterans and the nation for scandal involving the systemic delay of health care to veterans. In an interview broadcast Friday on "Live With Kelly and Michael," Obama said he will ask Shinseki whether "he is prepared and has the capacity to take on the job" of fixing the system. "I don't want any veteran to not be getting the kind of services they deserved," Obama said. Shinseki vowed to fire leaders at a Phoenix VA hospital where a VA inspector general investigation showed that 1,700 veterans were removed from any official list and kept waiting for appointments, some for up to six months or longer. "We now know that VA has a systemic, totally unacceptable lack of integrity within some of our veteran health facilities," Shinseki said. "The breach of trust involved the tracking of patient wait times for appointments." He said he took full responsibility for the scandal, but far from indicating he would step down, the VA chief talked about working "in the days ahead" to fix the troubled agency. Dozens of lawmakers from both parties and the American Legion, the nation's largest veteran service group. Investigators linked these delays with efforts by hospital personnel, at Phoenix and other VA medical facilities. to improve their performance records on wait times. Although Shinseki did not name the Phoenix officials he is moving to fire, he has placed three on administrative leave including hospital director Sharon Helman and associate director Lance Robinson. "We will use all authority at our disposal to enforce accountability among senior leaders who are found to have instigated, tolerated dishonorable or irresponsible scheduling practices at VA health care facilities," Shinseki said. 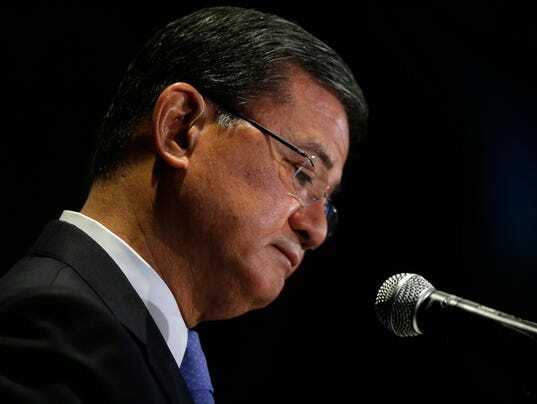 In remarks Friday, Shinseki said he was shocked by widespread evidence of a loss in integrity, admitted that he failed to see this was happening and said he would provide no bonuses to any medical directors in the 150-hospital system this year. A former Army chief of staff, Shinseki has been under fire since the scandal surfaced, and members of Congress from both parties have called for him to resign. Shinseki promised to hold accountable any medical officials found to have engaged in the same behavior at VA hospitals and clinics across the country. The IG report released Wednesday said 42 VA medical facilities are currently under investigation for delaying care and falsifying patient appointment records. In addition, Shinseki said that his own system-wide internal audit has found a similar pattern of lying about wait times. "I can't explain the lack of integrity among some of the leaders of our health care facilities. This is something I rarely encountered during 38 years in uniform. And so I will not defend it because it is indefensible," Shinseki said. His remarks came at the conclusion of a speech Shinseki delivered on veteran homelessness before an adoring audience of homeless veteran advocates who gave him a standing ovation when arrived. At the end of a speech in which he listed his successes in reducing veteran homelessness, Shinseki said it was time to address "the elephant in the room."